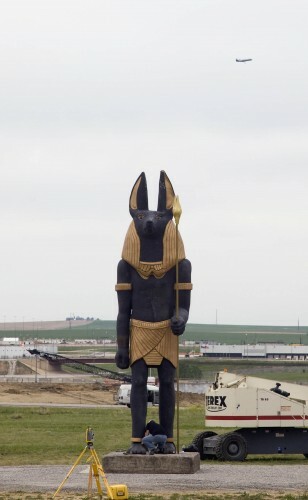 Perhaps to balance off the negative vibes some travelers may be feeling from having a 26-foot tall image of Anubis, the ancient Egyptian god of the dead, looming over the airport this summer, Denver International Airport has installed Cloudscape, a new outdoor sculpture by Christopher Lavery. Several hollow, corrugated metal and plastic clouds from 16 to 40 feet will be hanging around outside the airport for one year, offering a puffy greeting to travelers heading into the city. Anubis sits on the south side of the terminal and will be peering at passengers through mid-August as part of a promotion for a King Tut exhibit at the Denver Art Museum.